While I was moving my most often used supplies around a couple months ago, I kept getting hung up with some piles and open trays of stuff that didn't have a home. Stacks of store bought letterpress cards and pretty papers that I kept forgetting about were among the piles and I needed a better place to store them. I had some space under my main work surface and after checking a couple of measurements, I made a run to IKEA and picked up a white Helmer drawer unit. Click the images below to scroll through my drawers and see the contents larger. 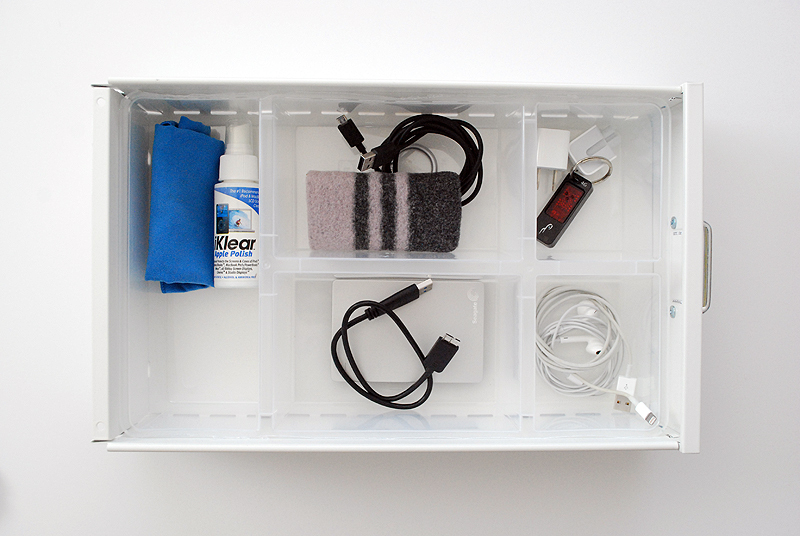 1. electronics : my external hard drive, phone and camera cables, thumb drive, earbuds, my Flip video camera and screen cleaner live here. I used an Antonius organizer to separate everything. 3. notepads : so many notepads and notebooks were scattered around my room and I love that they are consolidated now. 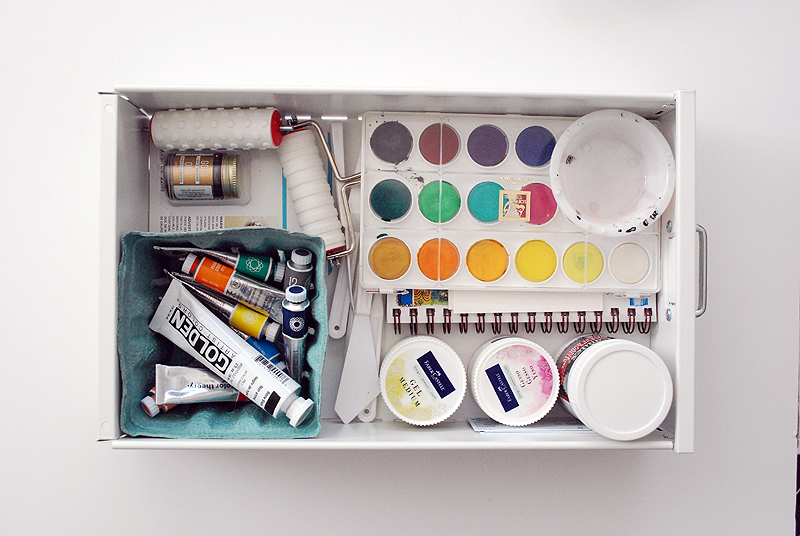 4. get messy : this drawer holds most of my paint and mixed media related supplies. 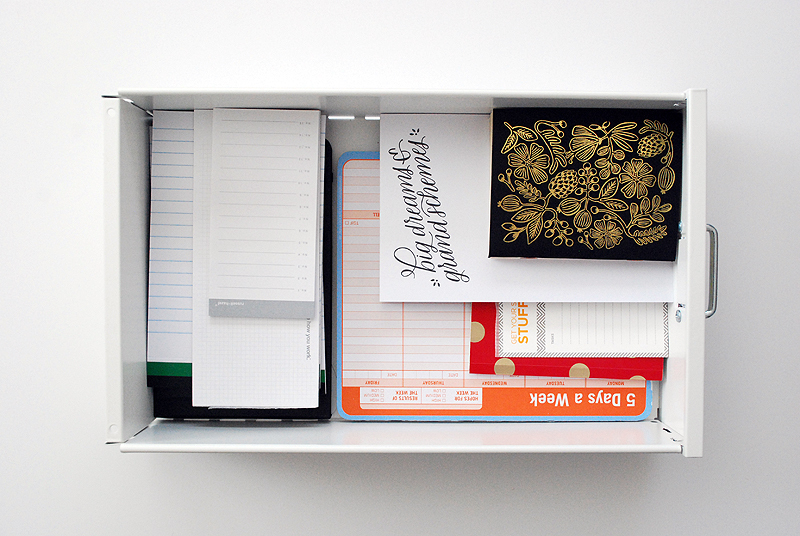 5. calligraphy : paper pads, inks, nibs and holders are stored here. 6. cards + envelopes : I used to be a big card maker but have pretty much given in to the fact that I don't enjoy it like I once did. 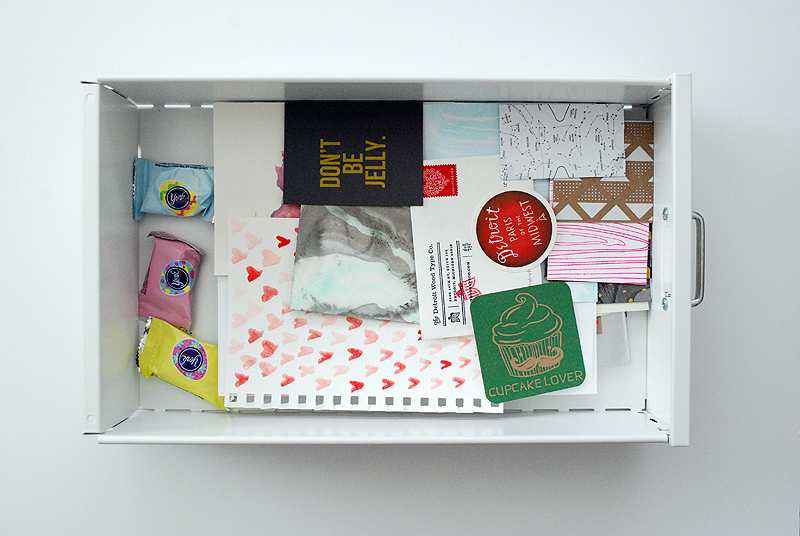 I do have a small envelope stash in here though, and also keep all of my store bought cards in the back of this drawer. My urge to reorganize all the things, all the time is strong, especially when something isn't working. It turns into a form of procrastination for me too, and my time is spent sorting + purging instead of creating. This little unit freed up some valuable desk space though and now I can get back to making stuff.